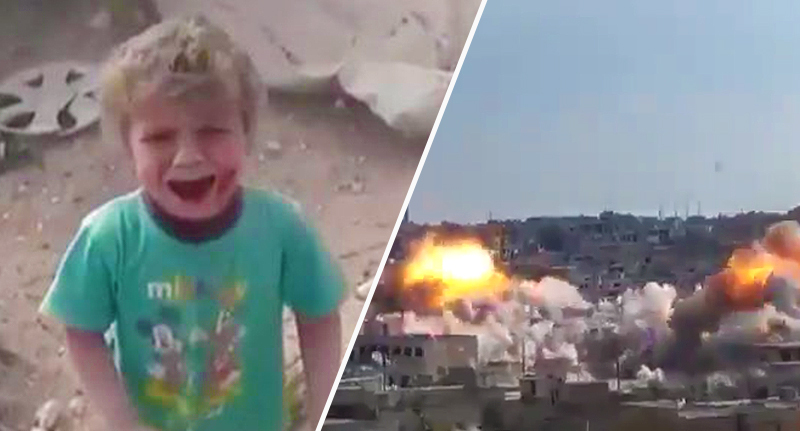 Footage has captured the latest air strike over the Syrian city of Al-Lataminah, which has left yet more destruction in its wake. In a heart-wrenching scene, viewers bear witness to a young toddler running out from the rubble and debris, screaming and crying, with what appears to be blood and ash covering his face. In the same video, a man can be seen carrying a motionless infant’s body away from the disaster area. In a further video, the numerous parachute bombs can be seen dropping on the compact built-up area of Al-Lataminah in the Hama province. As the bombs – constructed using landmines, dropped by planes using parachutes – hit, they release mushroom clouds into the sky. The man filming the bombings from a distant vantage point can be heard praying for the souls of those near the bomb site. It has been widely reported that Russia is responsible for the air strike, which is believed to be recent, according to the Mirror. However, there is no date stamp on the video and Russia have yet to respond to the allegations.